Head of Russian Reconciliation Center for Syria Major General Viktor Kupchishin announced that a cargo of a poisonous substance, likely chlorine-based, has been already delivered to the villages of Khan Shaykhun and Kafr Zita located in southern Idlib. Another batch was sent to Maarat Misrin north of the eponymous provincial capital Idlib city. The substance was packed in canisters disguised as oxygen and natural gas tanks, Kuptchishin added. It is expected that the poisonous gas will be dispersed near the locations of military positions and warehouses of the armed factions that were recently hit by the Russian air strikes. Officers of French and Belgian intelligence who were covertly dispatched to the area have already filmed some of the strikes with the intention to present the footage as “proof” of Russia’s responsibility for the alleged attack. Local residents were recruited to play the roles of chemical attack victims and received training in faking the symptoms of a choking agent poisoning. White Helmets members will be present in the area to “rescue” the victims and provide footage from the ground, while militants of Hayat Tahrir Al Sham, arguably the most powerful armed faction in Idlib and a former affiliate of Al Qaeda, will seal the area to secure the perimeter. On an even more ominous note, the Russian general said that there is “a distinct possibility” that the perpetrators will subject a number of the local residents to exposure to chemical warfare agents to ensure casualties among them and make the footage more “authentic”. This is not the first time Russia has issued warning of a false flag chemical attack by the opposition forces. Perhaps the most striking example of a similar plot is the attack that occurred in Douma city almost a year ago. 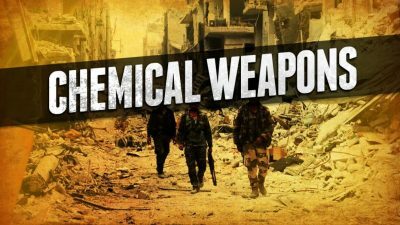 Back then, the opposition blamed the Syrian Air Force for using chemical weapons against civilians and succeeded in pushing the US and allies to launch missile strikes at a number of Syrian army positions in Damascus and Homs provinces. It would appear that due to systematic defeats suffered by the armed factions, the opposition has revived its attempts to play the “chemical card” at the approval of its foreign backers. Despite having been exposed multiple times, this tactic remains a valid threat to the fragile stability that is hesitantly returning to Syria. Ahmad Al Khaled is Syrian journalist, Official Representative of Special Monitoring Mission to Syria.